When your roof sustains damage, one of the first questions you may have is if you should repair it or replace your roof entirely. Most insurance companies will ask you to gather a few estimates to see if the scope of repairs exceeds your deductible. This is where things can get tricky…how do you know the scope of repairs if you aren’t sure if you should repair or replace your roof? A company that specializes in storm damage or a contractor that is Haag certified will be able to help you assess whether or not your roof should be replaced or simply repaired. Here are 3 things they take into consideration when making that call…. Age and type of shingle… in 2010, most shingle manufacturers switched the design of their shingles. This means that any roof installed after 2010 is highly unlikely to not only match an existing roof aesthetically speaking but also technically. In this case, the roof would be better suited for replacement rather than repair. Surrounding damage… often times, a few missing shingles can be a sign of greater damage. Shingles can be cracked or loose all over the roof, which means damage far exceeds replacing just the one or two shingles that are gone. 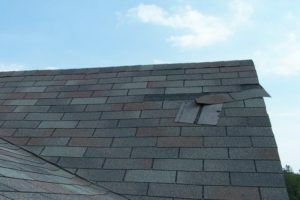 Repairing the most obvious damage would only be a temporary fix and the roof would continue to sustain damage over time. You would find yourself continuously repairing your roof. The area underneath the missing shingles has been damaged… shingles are designed to protect your roof’s decking from moisture and wind. Even a small exposed area can allow water to seep into the underlayment and into the deck, where it can cause rot and eventually leakage. In order to replace the decking or underlayment, you would have to remove more shingles in which case, a full replacement would be justified. If you are unsure if you should repair or replace your roof, give us a call or contact us directly. We would be happy to inspect free of charge!